You've got to respect Microsoft for making a big deal out of Windows 8's reset and refresh features. Useful as they are, the main reason these features exist is because sometimes, PCs can go haywire. A new blog post by Microsoft's Desmond Lee explains Windows 8 refresh and reset in detail. Although Microsoft already revealed these Windows 8 features at its BUILD conference last September, the new post help clear up exactly how they work. In Windows 7, the best way to restore to factory settings is to make a backup right after starting up the computer for the first time, then use that backup when you want to restore. Of course, if you forget to create a backup, you're out of luck. 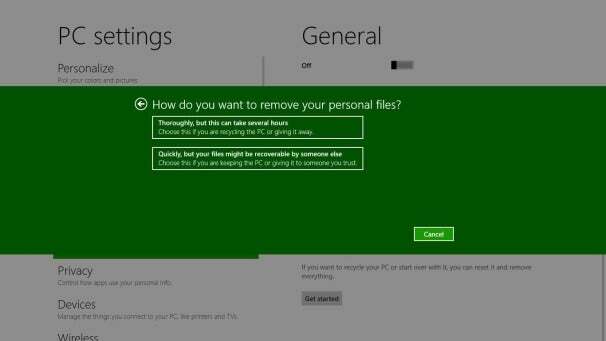 With the reset feature in Windows 8, users can wipe out all their data and start from scratch without creating a backup beforehand. Starting with the Windows 8 beta, the reset feature will also include a "Thorough" option, which makes personal data harder to recover by writing random patterns to every sector of the drive. This takes longer--about 24 minutes without BitLocker encryption, compared to 6 minutes for a quick reset--but it makes data difficult to recover without expensive special equipment. The Thorough option is ideal if you're giving a used PC away. Because sometimes things can go wrong, Microsoft has also created a way for users to install a clean copy of Windows 8 while preserving apps, personal data and settings. This entire process takes about eight minutes. As Lee explains, bad apps or incorrect settings are often the cause of PC misbehavior. To deal with this, Windows 8's refresh feature only hangs onto a few key settings, including network connections, BitLocker encryption settings, drive letter assignments and personalization (such as wallpapers and backgrounds). File type associations, display settings and firewall settings are restored to factory defaults. Also, the refresh feature only re-installs Metro-style apps, which have been approved for the Windows 8 app store. Microsoft argues that it'd be nearly impossible to figure out which non-Metro apps are causing problems, and that some desktop apps use third-party installers that Microsoft doesn't have much knowledge about. Users who want to reinstall their apps will find a list of deleted software in HTML format on the desktop. Or, they can use a command line tool to create a refresh state of their choosing. 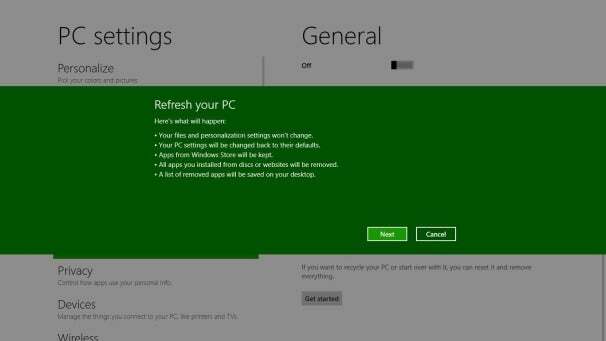 Windows 8 reset and refresh will be accessible through the "PC Settings" Metro-style app. But in case the computer can't boot properly, they'll also be part of Windows 8's redesigned boot menu. Both these features will be available in the Windows 8 beta, due to launch at the end of February.